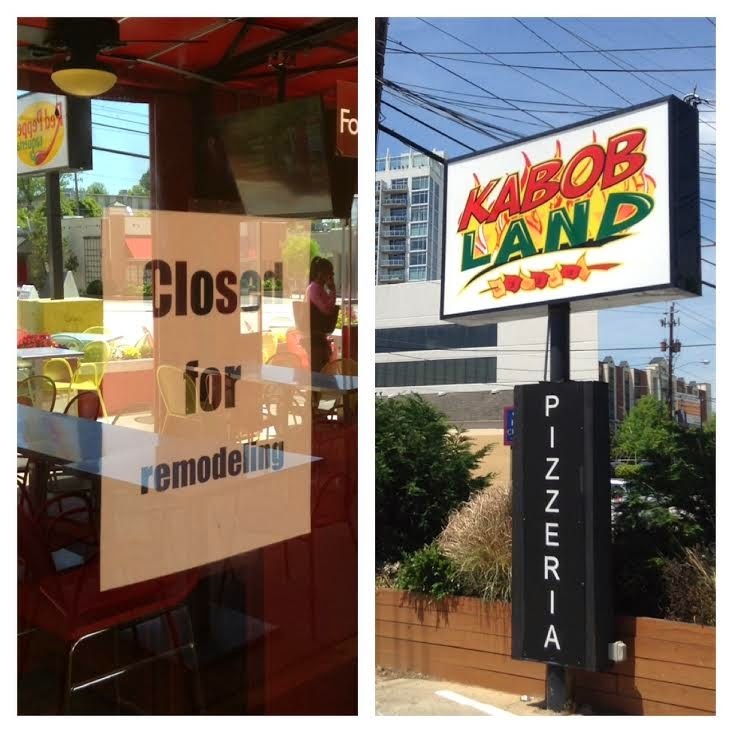 Kabob Land, reportedly a partnership between at least two existing restaurateurs, will open in the coming weeks in the former Ray's Pizza on Piedmont in Buckhead. The restaurant will feature a variety of kabobs as well as other Mediterranean fare. Ray's was franchised by Mimmo Alboumeh, owner of adjacent business Red Pepper Taqueria. Alboumeh opened Ray's basically because he inherited the equipment from previous pizza tenant, Tartufo. Apparently unable to deliver the same Ray's New York style pizzas consistently, Alboumeh decided to exit the pizza business and focus on the successful Red Pepper concept. While plans to convert the space have reportedly been discussed for months, Ray's closed about a month ago, with plans for Kabob Land to open in four to six weeks. Mimmo's Kabob-o-Rama must have already been taken. Is it possible he is trying to be purposely so bad with the concept and the signage that it actually gains a local following due to it's absurdity? I think that's their best bet. I mean, why do people spend time and tens thousands on dollars on something that is going to lose thousands of dollars PER WEEK. Who has this money to just throw away? Red Pepper is a VERY underrated place to eat. I've really enjoyed every meal there. If it doesn't work out, maybe they can adjust their signage, start making Jewish desserts, and call themselves Babka land. Parking there is a disaster. Only one side of the street can access it. Just not a good spot for a restaurant. Better up top in that old Container Store spot.